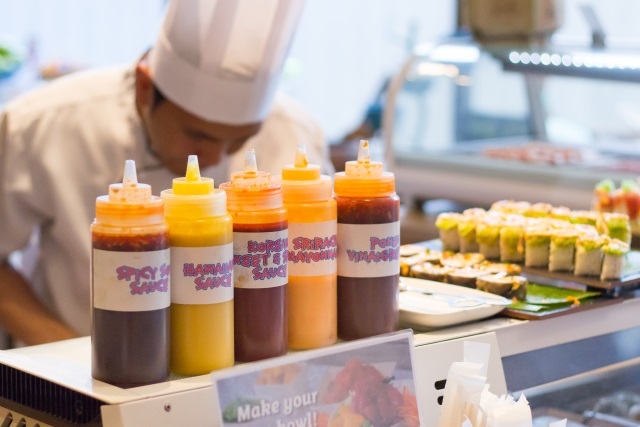 Flavors Restaurant, the all-day dining restaurant of Holiday Inn & Suites Makati, brings back the Poke Bowl Station in its lunch and dinner buffet spread, and is now available the whole weekend (Friday to Sunday) stating from March 15, 2019 until April 21, 2019. Step 1 - Fill the base of your bowl (about 1/3) with white rice or brown rice. If you are cutting down on carbs, you can replace rice with shredded carrot, radish, cabbage or lettuce. Step 2 - Top the rice with your choice of vegetables and fruits. Step 3 - Add sliced tuna or salmon, or both if you wish. Step 4 - Top your poke bowl with your choose of sauce. Step 5 - Mix all ingredients in your bowl and enjoy. Choices of pre-mixed poke dressing include Spicy Soy Sauce, Hawaiian Sauce, Korean Sweet & Chili Sauce, Sriracha Mayonnaise, and Ponzu Vinaigrette. 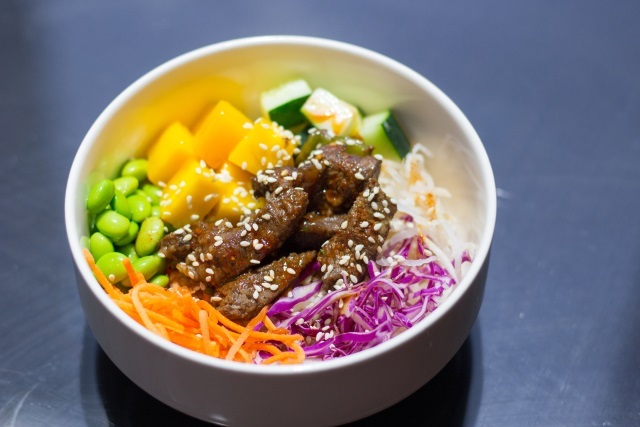 There are no rules here, so you can be very creative in making your poke bowl. All the ingredients work very well together. You can also mix two poke dressings and the taste will still turn out delicious. During my visit, I had my poke bowl with salmon and mixed it with Sriracha Mayonnaise and Korean Sweet & Chili Sauce. If you are unsure or uncomfortable to make your own poke bowl, you can always ask the chef at the station to make one for you. Just watch how he does it and maybe for your next bowl, you can try to make one for yourself. 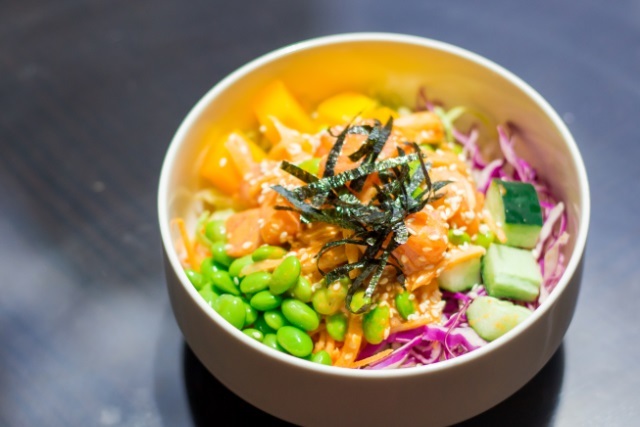 Guests who are allergic to seafood can still enjoy poke bowl. You can make a poke bowl without salmon or tuna, or substitute the fish with other meats from the buffet. I suggest the grilled chicken or beef from the Grilling Station. This poke bowl for example had pieces of Beef Salpicao and Spicy Soy Sauce as dressing. 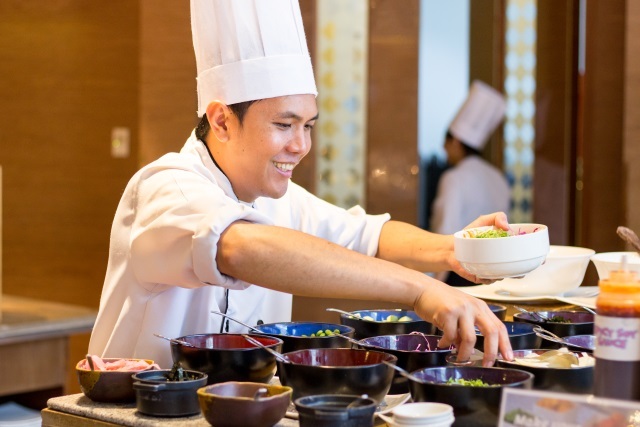 The Poke Bowl Weekends is available as part of the Buffet Lunch and Buffet Dinner spread every Friday, Saturday and Sunday at Flavors Restaurant. 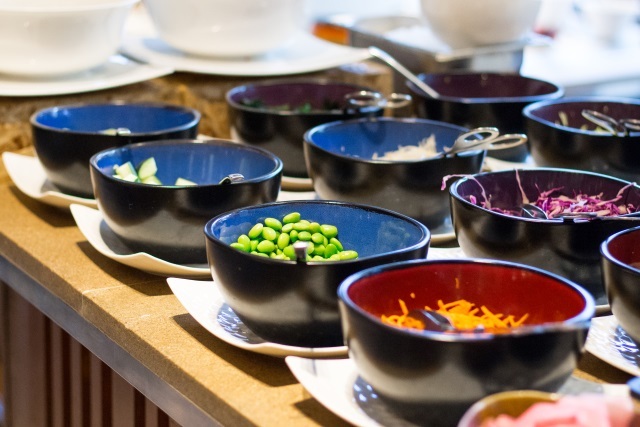 Buffet lunch and Buffet dinner are at P1,850 nett per person. You can also avail of the Poke Bowl Only Buffet promo at P800 nett per person. To book a table, you can call +63 (02) 909-0888 local 7429 or you can email them at hism.fb@ihg.com.